Faculty of Medicine students took home three of the five prizes at McGill’s at the 8th annual edition of the 3-Minute Thesis/Ma thèse en 180 secondes competition, held at Tanna Schulich Hall on Tuesday, March 12. This year’s winner in English was Zeinab Sharifi, PhD candidate in Experimental Medicine. Mariève Cyr, a Masters student in Psychiatry, won in the French language category. This year’s second prize winner was Will Joggia, Masters’ student in Microbiology and Immunology. No props. One take. One slide. Three minutes. The 3-Minute Thesis/Ma thèse en 180 secondes competition is the academic version of the elevator pitch. 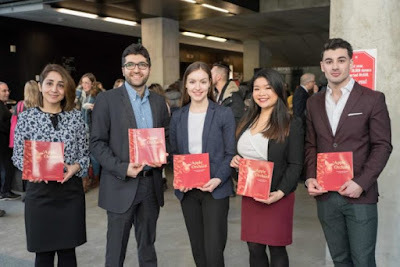 The 8th edition of 3MT was held at the Tanna Schulich Hall on Tuesday, March 12, from 2 – 4 pm before a crowd of some 150 people. Eighteen graduate students, nine women and nine men, presented years of research to a rapt and sympathetic audience in an entertaining and lively crash course on their respective research. In all, 11 PhD candidates, and seven Masters students took part in the final heat, whittled down from a record 104 McGill graduate students who entered the competition when it started last fall. Of the 18 finalists who presented 16 are studying in Science Technology Engineering and Medicine (STEM) subjects, and two are in Arts. The numbers underline how 3MT/MT180 is really catching on at McGill. Dean Nalbantoglu said that the first year of the competition saw 30 entrants, rising to 60 last year and up to 104 this year. Next year she expects an even larger number as word gets out about the extensive communications training offered to entrants.